NASA's Wallops Island Station was located about 100 miles as the rocket flies from where I grew up in Mayo, Maryland. That was close enough that many of the colored skies created by sounding rockets conducting atmospheric research were visible. Local newscasters would broadcast announcements ahead of tests so that the populace wouldn't think we had been invaded by aliens (no, not the ones from Mexico) or were not under attack by the Russkies. 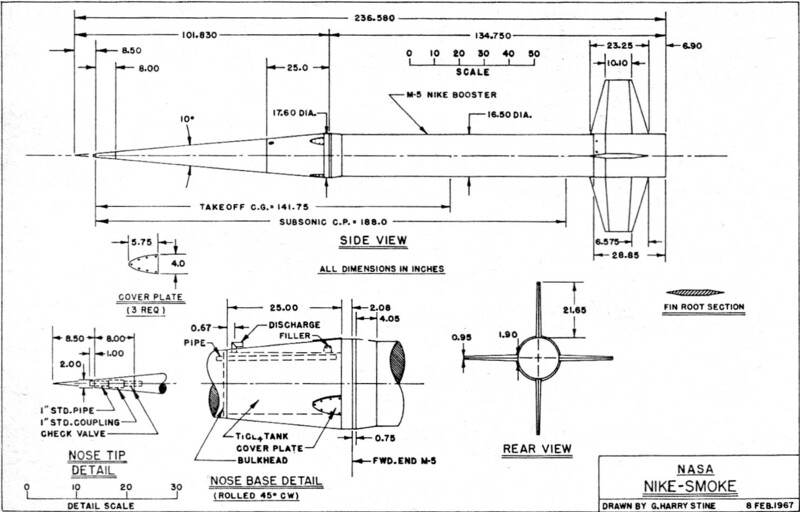 This article on the Nike Smoke rocketsonde, by überrocketeer G. Harry Stine, provides some historical data as well scale dimensional data and a drawing for use in building a scale model if you are so inclined. The full story - and specs - of an ideal subject for your scale project. The real bird was used to measure wind movement at 75,000 feet. So much data is available on this rocket that it can be used in many NAR events - predicted altitude, scale, trajectory and aerodynamic studies, etc. But don't attempt flight operation with the TiCl4, it makes hydrochloric acid! In the February issue, we discussed some aspects of scale modeling, an area of model astronautics that is growing rapidly and gaining favor with both beginners and experts alike. The usual approach followed by a novice is to choose as a subject a rocket vehicle that is relatively well known. However, some of these vehicles are often very difficult to build into a properly flying scale model. 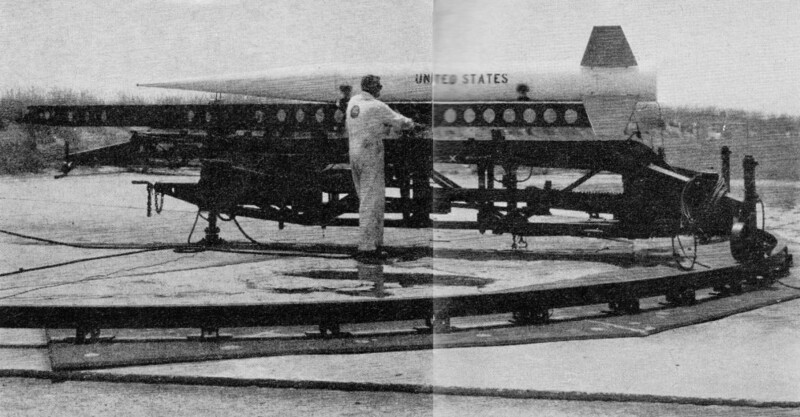 There are dozens of different sounding rockets, some of them not well known but yet widely used by NASA and the armed services; these "obscure" vehicles are sometimes excellent scale subjects. An example of this is the NASA "Nike Smoke" rocketsonde. Over 100 of them have been flown from both Cape Kennedy and NASA Wallops Station. Use this scale drawing for designing your Smoke. The real rocket is single-stage, solid-propellant. Leaves white trail in sky to be photographed. The information on the Nike Smoke vehicle that follows has been acquired from authentic sources and, accompanied by the drawing and photographs, is considered to be the typical sort of scale data for both general and competition purposes. This is what a scale modeler starts with, and it's up to him to go through the process of scaling, sizing, and designing from this information in order to come up with his scale model. The Nike Smoke sounding rocket is a single-staged solid-propellant rocketsonde used by NASA to determine wind velocities up to an altitude of about 75,000 ft. The propulsion unit is a standard M-5 Nike solid propellant rocket with four cast and wrought magnesium fins. The payload is approximately 10 gallons (144 lbs.) of titanium tetrachloride (TiC4) contained within a 10-degree conical nose cone fabricated of 347 stainless steel. Upon ejection of the TTiC4 into the atmosphere during flight, chlorides are formed which combine with the water vapor in the air to form droplets of hydrochloric acid. This reaction results in the formation of a persistent and reflective white trail which is photographed by two cameras approximately 10-12 miles from the launch site and 90 degrees apart in azimuth. Wind profiles are obtained by photographic triangulation techniques utilizing time-lapse photographs of the smoke trail. The Nike Smoke may be launched from a modified Nike Ajax launcher. The Nike Smoke being prepared for a launch at Wallops Station, Va. Over 100 such vehicles have been flown. History: The Nike Smoke program was under the direction of NASA Langley Research Center, Va. During the period from May, 1962 to May, 1963, 55 vehicles were flown from Cape Kennedy with a launch elevation of 80 degrees and on an azimuth of 60 degrees. Fifty-three percent of the vehicles fell within a radius of one nautical mile of the desired impact point, and 91 percent of the vehicles were within a radius of two nautical miles of the impact point. During the period from July, 1963 to January, 1965, approximately 70 vehicles were launched from NASA Wallops Station with a launch elevation of 80 degrees and on an azimuth of 100 degrees. Project engineer was James C. Manning. The Project Manager was Harold B. Tolefson, and the engineers involved in the project included Charles M. Dozier, Robert M. Henry, and Robert W. Miller. Operation: The components of the Nike Smoke are assembled, checked for alignment and CG. The vehicle is then placed horizontally on a standard Nike Ajax launcher or a boom launcher. Approximately ten gallons of TiCl4 are loaded into the canister inside the nose cone. The vehicle is then raised to launch elevation. A standard, zero-delay M-24 electrical igniter fires the vehicle on ground command. During thrusting, while the vehicle is being subjected to high positive acceleration, the chemical is forced against the bottom of the canister; thus, the chemical surface is about 1" from the top plate. Air is forced into the nose cone by ram pressure through a 1" pipe and check valve, and enters the canister through the pressurizing pipe. It then bubbles through the chemical and flows out through the discharge orifice which is approximately 5/16" in diameter. A small amount of TiCl4, is also expelled during vehicle acceleration. Upon burnout of the Nike M-5 booster, the vehicle deceleration caused by aerodynamic drag forces the chemical against the canister top plate. The impact pressure inside the nose cone then forces the chemical out through the discharge orifice until the chemical supply is exhausted. The check valve in the nose tip traps air in the upper portion of the nose cone and, as the vehicle ascends into the thinner upper air, this pressure continues to expel the chemical. The discharge orifice size is calculated to expel the chemical at such a rate that it becomes exhausted shortly after the vehicle reaches apogee. The entire vehicle is permitted to impact with no attempt being made to separate or recover the vehicle. Photographs are made by the two trajectory cameras at six second intervals for a period of five minutes. These photographs, when reduced by photogrammetric data reduction techniques, provide profiles of wind velocity and shear. Weights: Gross (takeoff): 1560.7 lb. ; Propellant: 764 lb. ; Burnout: 796.7 lb. ; Payload: 144.0 lb. ; Empty: 652.7 lb. ; M-5 Nike booster: 431 lb. ; Fins: 69.2 lb. ; Nose assembly: 152.5 lb. Performance: (80-deg. launch angle): Burnout time: 3.5. sec. ; Burnout altitude: 6294 ft.; Burnout acceleration: 47.2g; Apogee: 75,200 ft.; Apogee time: 65 sec. ; Splash time: 147 sec. ; Splash range: 56,500 ft. Propulsion: Hercules Corp. Nike booster M-5 (X216A2): Thrust: 48,700 lb. ; Duration: 3.5 sec. ; Propellant: solid. Color data: (Wallops flights): Flat white overall. Three fins fluorescent red, one fin fluorescent yellow. UNITED STATES in letters 8" high, stenciled in black on both sides of vehicle in horizontal position inter-digitated between fins and centered along booster body. Data sources: Nike M-5 booster and fins from Thiokol Chemical Corp. Astro-Met Division Drawing No. R-00150. Vehicle description, history, performance data, and dimensions from NASA Langley Research Center "Flight Plan for Model W67-3604 Through W67-3670," dated June 6, 1963. Color data from NASA color photo L-63-6297 and from NASA Wallops Station Memorandum, "New Color Scheme for Wallops Test Vehicles," dated January 23, 1964. Additional details from NASA photographs L-61-8048 and L-65-4760. Note to modelers: Because of the small fin area set forward of the boattail, the Nike Smoke should not be made with a body tube diameter of less than 0.9". Some dynamic instability (pitch-roll coupling) has been experienced with this model with a Centuri #8 tube for a body, balsa nose without nose weight, and powered by a Type 1/2A.8-2 engine; the addition of a nose weight is recommended for a model in this scale. The Nike Smoke model may also be used for trajectory and aerodynamic studies because its subsonic drag coefficient is known. Drag coefficient during thrusting is 0.45 and during coasting is 0.85. Calculated performances can therefore be compared against measured flight performances. The Nike Smoke scale model is suitable for the following events: Scale, Scale Altitude, Space Systems, Super Scale, and Predicted Altitude. Do not attempt to duplicate scale flight using titanium tetrachloride! This chemical forms droplets of hydrochloric acid upon contact with the water vapor in the air! Centuri Engineering Company has kitted the I.Q.S.Y. Tomahawk (October 1967 Countdown. Kit KC-40 goes for $2.25. This is an excellent beginner's scale model which should not be sniffed at by competition flyers; it took more points at NARAM-9 than any other scale design. The I.Q.S.Y. Tomahawk can be flown in all types of scale competition, including the new NAR Space Systems event. By leaving out the engine mount for the 18 x 70 mm engine, you can fly the bird with an FSI engine ... a real cloud-cutter with that power plant! It can also be converted to a payload-carrier for competition work. Your scale substantiation data can be the October 1967 Countdown article, which is available as a back issue if you didn't get it. Model Rocket Industries T-20 tube fits an FAI-NAR Payload like a glove fits a hand. Furthermore, the T-20 tube (so-called because it has a 20 millimeter o.d.) is light. An Estes BT-20 tube will slip-fit inside of it, too. Talley Guill's Dubnica Pay loader (Countdown, September, 1967) can be made with an MRI T-20 tube throughout, giving it the same o.d. from the base of the nose cone to the tail. This eliminates the difficult transition piece because a simple balsa nose block is substituted instead. Carefully made, the T-20 Talley-Bird has somewhat better aerodynamics which will permit it to hoist an FAI-NAR Payload perhaps another 100 ft. (30 meters). The launch lug can also be glued directly to the side of the T-20 instead of sticking out on a standoff like a built-in headwind. To commemorate the Tenth Anniversary of the Space Age on October 4, 1967, the General Electric Missile & Space Division invited the NAR National Champions to visit their Valley Forge (Pa.) Space Technology Center. Charlie Duelfer, Bill Bloch, Greg Scinto, Joe Persio, and Mark Mercer, accompanied by NAR Trustees Harry Stine and Jim Kukowski, spent the day at Valley Forge with G. E. space engineers viewing the NIMBUS-B to be launched early in 1968, the hypersonic shock tunnel, the space environmental simulation chambers, and the NIMBUS ground station. Following lunch, the NAR model rocketeers returned the favor by flying over a dozen model rockets from the helicopter launch pad outside the Valley Forge Space Technology Center. They then met with G. E. Vice President Hilliard W. Paige, and Charlie Duelfer presented Paige with a scale model Thor-Agena-B which had flown and been recovered that day; the Thor-Agena-B modeled by Duelfer had launched the G. E. Discoverer-13, first space capsule ever recovered from orbit. "When you finish school, come back and see me," Paige told them. "The aerospace industry is going to need all of you fellows that we can get!" 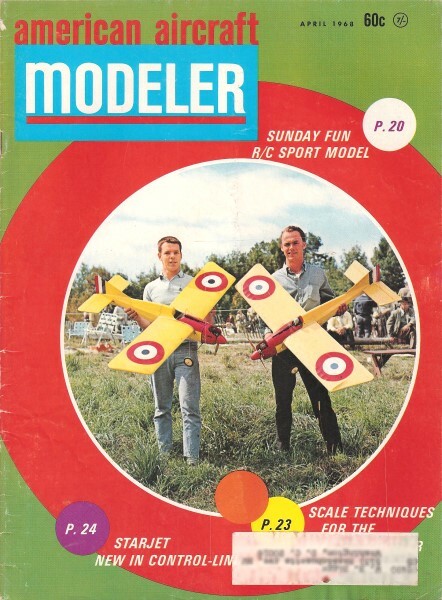 This was the first time that a major aerospace company had ever invited NAR model rocketeers to both tour their facilities and also fly models. Both the NAR Champions and the G. E. space scientists parted with great respect for one another. And it showed that model astronautics, born with the Space Age in 1957, has come along as rapidly and as successfully as astronautics itself. Three generations of rocketeers were together that day - rocketeers who had flown the German V -2 rockets from White Sands, present-day NIMBUS and Discoverer satellite engineers, and the model rocketeers who will be the astronautics engineers ten years from now. Two new, honest-to-Wernher scale models are now available in kit form. These are real scale, not semi-scale. Estes Industries Saturn-Ib is worth its $9.50 price, if you are an advanced modeler looking for a real challenge. It is a highly detailed scale model. (Photos appeared January issue.) It has been accurately scaled from NASA drawings. For those of you who wish to get scale substantiation data so that you can fly Saturn-Ib in contests, write to the Public Affairs Office, NASA Marshall Space Flight Center, Huntsville, Ala. and ask for a set of the special modelmaker's drawings of the bird which they have prepared for model rocketeers.